The H-Compressor and H-Delay are staples in the recording world and are used in a great deal of tracks across many genres. 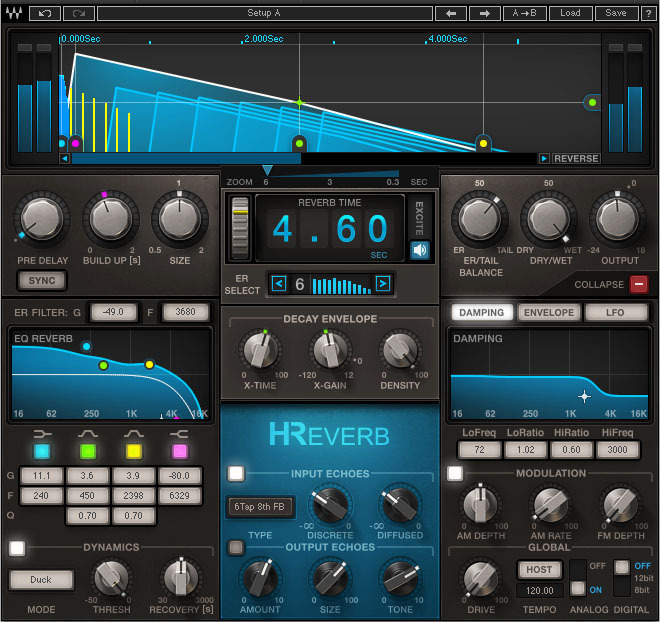 Now Waves have added a new reverb to the mix with H-Reverb. Waves Audio is now shipping the Waves H-Reverb plugin, a pioneering reverb based on innovative algorithmic FIR (Finite Impulse Response) reverberation technology. H-Reverb provides richer, deeper reverb tails that sit beautifully in the mix while breathing crisp air into your tracks. By fusing classic reverb sounds with forward-thinking features that break new ground in digital reverb processing, H-Reverb provides uncompromising sound quality and creative control. H-Reverb incorporates Waves’ advanced analog modeling along with a drive control, offering signal behavior that until now was found exclusively in high-end hardware reverb devices. This unique design also enables input drive, a technique favored by many top engineers. The FIR engine also lets you shape and customize the reverb decay envelope in ways beyond the linear standard, resulting in perfectly gated, real reverse, and very long and dense reverb tails. To top it off, H-Reverb includes an impressive library of artist presets from the industry’s leading mixing engineers. Their personal settings may be the perfect space you’re looking for, or simply the perfect point to start from. Their inclusion marks a new standard in the quest for reverb perfection.